My dad was a workhorse. In my early teenage years, I sensed that my dad had a fair amount of stress at the shop, where he was sole proprietor with one other mechanic hired to fix equipment. “They hornswaggled me,” he said when a company didn’t follow through on promises or when farmers shirked paying their bills. Once in a while I heard the epithet “Shitmolink,” a word I think he made up to pronounce contempt for anyone who “hornswaggled” him. Then I saw a blue vein throb on the side of his forehead, probably evidence of the high blood pressure his doctor later diagnosed. He never used other four-letter curse words. “Are you glad you’re happy?” a bland question I didn’t hear often but when I did, I knew Daddy was expressing his own contentment, however fleeting. 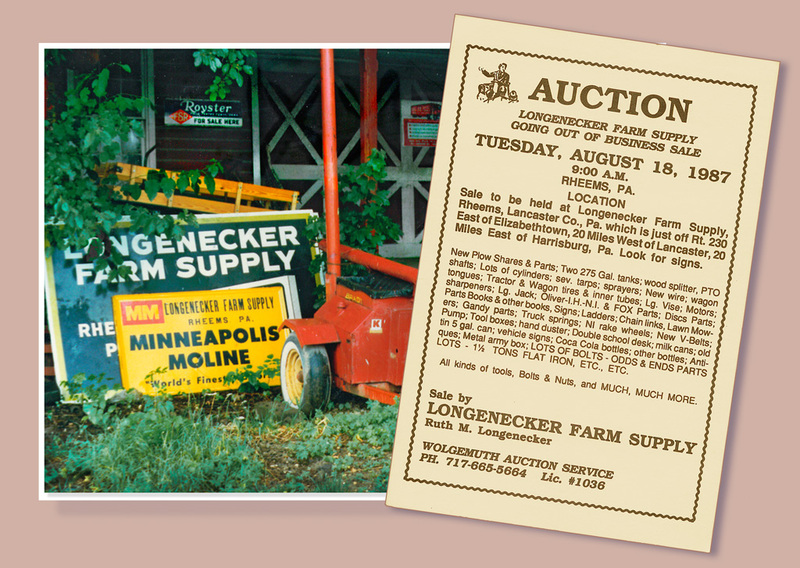 End of an Era: My father died in 1986 and his business was sold in August 1987. Did you live on a farm? Have a garden? Could you or any of your relatives be classified as workhorses? What kind of physical work do you remember doing as a child? Lovely tribute to your father, Marian. My father was born and raised on a horse farm. He often did a days work before he left for school, only to return home to more chores. Like most kids these days, my sister and I had it easy in comparison. We did have it easy compared to a few generations back. My mother said she and her sister had to peel potatoes and milk cows (brothers probably helped with the milking too) before school. Thanks for kicking off the conversation here, Jill! Good morning, Marian! I have no experience with farm life, and my parents were not gardeners either (nor am I). They both worked hard and long hours, but it was not physical labor. I think your parents were merchants, but I can’t recall the details except that I know you mentioned they worked very hard. Plowing through manuscripts and writing your own is hard work too. Thanks, Merril! Cliff, the photo restoration expert, thinks the mule photo is a classic. We found it just last year in the heaps of pictures. I’m glad you appreciate them! Yep. Another farm girl here. I did most of the hard manual labor along with my father and siblings. I’ve compared growing up on a farm to using a heavy medicine ball in basketball practice. Everything else seems easy by comparison! I’ve never seen the image of a medicine ball used in this context but it fits perfectly. Right now I vote for memoir writing as comparable to hard manual labor, but in the mental/emotional sense. Work in the fields requires persistence over time too, another good preparation for the writing life. Thanks for adding your true bit, Shirley! 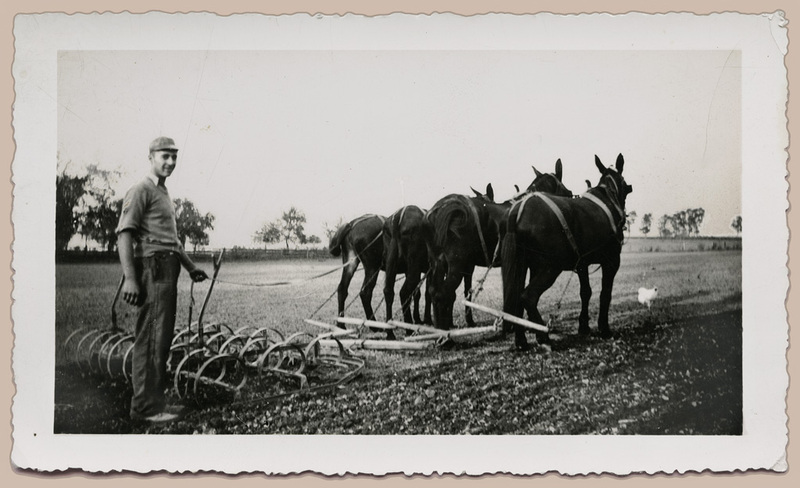 My father was a farm boy and had a mule by the name of Jack that pulled the plow that my dad walked behind. If nothing else, our father taught us the hard work ethic with a three acre garden behind a small town grocery store. We lived and worked there and survived to be contributing adults. I applaud the ethics he modeled before us. Like mine, your dad was bi-vocational: in the acreage and at your grocery store. By the way, you did more than survive to become a productive adult, you are indeed thriving, Carolyn. Your posts are wonderful snapshots into history, Marian! My parents were share croppers, so they worked very hard! I didn’t live on a farm, but when we went to visit my grandmother in Louisiana during the summer, we had to feed her chickens. At home, I had to wash dishes, mop, and cook. My brothers took out the trash and did the yard work. I wished we could have switched chores! Yup, I’m another farm girl and yup, my dad was a workhourse. We didn’t have mules but we had a team of horses that did the work until we got a tractor. I don’t know many men that could work as hard as my dad. He would finish his work and then help out the neighbours. As they say, they don’t make ’em like that any more. A great tribute to all those hardworking fathers who taught us the value of an honest day’s work. I know your dad was a workhorse on his farm in Alberta. The mules were retired when I was old enough to work in the fields. We used tractors only then. Thanks, Darlene! I wonder if you are still vacationing in France. When we first moved to West Wales we lived on a farm and it opened my eyes to how hard famers work . My Dad was a bit of a workhorse . He was only happy when he had a project . We have a plot for a garden but not yet landscaped . Here’s to you and work-horse dreamers everywhere, Cherry! It’s hard work to use your imagination, lots of energy expended. Thanks too for sharing your father’s farming past. My dad also had a red Massy Harris tractor, although his brother farms with green Deeres. In the photo, does that tractor really have only one front wheel! What a “workhorse”! Welcome and thanks for commenting here and also on my Facebook page. My dad drove whatever brand of tractor he was selling at the time. The ones I remember best were the gold and red Minneapolis Moline and New Idea, which I think was blue and gray. He never sold John Deere’s, still a popular make. I think the tractor pictured had two front wheels, with one perhaps detachable to do certain types of plowing and cultivating ~ only a guess. Joy, I did leave a comment on your blog today! I’m glad we have this connection. You wouldn’t want the parlor generals to hornswaggle you! Obviously. As a child I visited a great aunt who lived with her children on a farm, and did not like the place at all. Too smelly, too dusty. Not at all like our city life wherein physical activity was playing tag or biking on streets or swimming at the pool club. I was not meant for farm life, and I knew it even back then. I enjoyed reading your to-do list as a child, Ginger. And, like me, no allowance either. Now I wonder if a “reel-type” is what I would call a push mower, with handles and pushed by hand. I know what you mean when you say, “Physical labor has never stopped me, but I’m a bit slower now.” Me too! Marian — I enjoyed reading about your dad and seeing the photographs! I wasn’t raised on a farm, so I don’t have any experience in that area. As I child, my physical exertion was in the form of endless bicycle rides, hiking, and climbing trees. Come to think of it, it’s the same today — although I’ve substituted yoga for tree climbing. Your cultivating picture certainly brought back those memories from the farm, a frequent June job, cultivating corn. Dad always wanted to “have the corn laid by by the fourth of July.” [Tall enough that we no longer had to cultivate it the rest of the summer. Yay.] Those were probably the only times I was allowed to drive tractor–having two older sisters who jumped in line in front of me, and then followed not too far behind by a brother who was truly a farmer for some years. Yes, we worked like horses some days. And got burned like whitefaces–to my chagrin now and for the benefit of my dermatologist. My main job on the farm was gathering thousands of eggs, every day, no sun exposure there. Hardest job? Bailing hay. I could not lift the hay bales but Pert did; I did lift straw bales. Daddy made it fun by breaking open a watermelon after a long hot day in the field. Thanks for the prompt! Like the split-open watermelon, your memories have poured out here for me and others to read. Thank you! How lovely to read about your dad, Marian and it bought memories of my childhood…I was taught how to milk the cows by hand. This was before those mechanical milkers came in..I used to run behind the harvester and help stack the bales..Pea picking and potato picking earned me a bit of pocket money but I loved it and feel I have come full circle now. I am impressed with all the hard work you’d as a child. Wow! Am I correct that you grow rice in Thailand now? I do know that you savor making recipes with organically grown produce. Every Spring and Fall, we’d go to our woods to cut, chop and stack. Sometimes Dad rented a log splitter. My job was to sit on a log stool at one end and operate the controls. Mom always packed a picnic and the bathroom was the nearest bush. So you’re from woodchopper stock, Jenn! You have painted a vivid word picture of the procedure though I’ve never seen the operation in real life. And you show how picnics and marshmallow roasting offset the hard work. . . . and of course treasured memories with your dad! Thanks for sharing from this chapter of your life. Loved your photos, Marian! In Paraguay my dad began the pioneer life with a pair of stubborn oxen that took off with the wagon full of kids! Fortunately, no one got hurt. Later he got a pair of jet black horses and he was proud of driving the buggy with them. There was a time when he and I had to drive to the nearby town weekly because I had an ear infection, and it was a bonding time for the two of us. I remember watching how the white foam formed on the horses’ rear ends as they jogged along in the heat! In Canada we moved into town and we always had a large garden which was my dad’s responsibility, but we all had to help. He was also the caretaker of the large flower garden in the dairy where he worked for 15 years. We all learned our work ethic from our parents. Nothing but hard work when you have 8 children to support! The work was hard but your descriptions are vivid. I can just visualize white foam forming on the horses’ rear ends. Amazing! You and I both have memories stemming from earth’s bounty: flowers, vegetables, and the animals that helped till the soil. Blessings on you as you continue the hard work of writing your memoir! Kudos to Cliff for restoring those magnificent photos Marian. 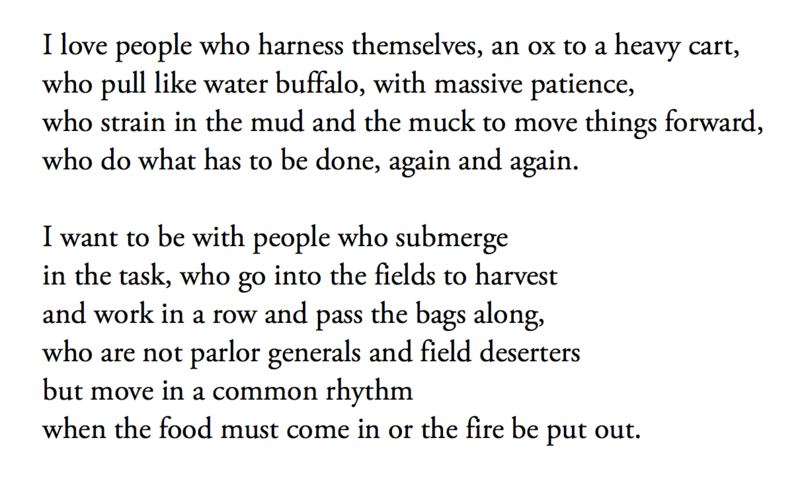 And to Marge Piercy for her homage to hard honest labour of the land. And to you for your memories of your father. Love those descriptive words!! Susan, you are supposed to be on vacation – ha! Anyway, thank you for showing up here, keeping in touch with your online connections. I will pass the compliment on to Cliff, his restoration a labour of love, but labour nonetheless. Thank you always for your encouragement here! Thank you for paying attention to my Memoir Moment, Debby ~ and to the info about Gordon. I know he is a topnotch salesman, but I didn’t know about his farm background. Driving a tractor at 8 years old is pretty spectacular! Your father sounds like a wonderful man (despite the salty language!) Thanks to you AND him for contributing an exciting new word to my vocabulary! Shhhhh . . . Please don’t tell Sage! Thanks for reading and noticing this bit in my memoir moment, Rebecca. Often, when I drive by a farm, many feelings and thoughts overwhelm me. They range from “I wish I could be in such close proximity to animals all day and provide my own food” to “So much hard work, and getting up early, it wouldn’t be for me” to “If I lived on a farm, I could never travel” and they always end in having a lot of respect for the people who provide our food and work the fields. So, no I don’t have any experience with farm life. 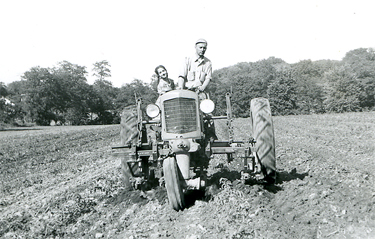 When my parents grew up (in Belgium), they lived close to farms and sometimes helped out. And, they receive their milk delivered to the door, fresh from the cows. As other commenters have said, we have it much easier now. But… we (the Royal we) have lost connection with nature, because of it. One of the reasons why I enjoyed my life on the water for eight years, was that connection, understanding, and respect for Mother Nature. Physical work as a child? Wash my parents’ car for pocket money. 🙂 The work we do is mainly mental work. That being said, Mark and I have plans to change that around in the near future. I think you are making wonderful memories in Croatia right now. Thanks for keeping in touch here, Fiona. Wonderful pictures. You had a hard-working dad. It’s lovely to see you here, Jacqui. And I’m happy that your work is being showcased on at least two blogs I’ve read this week. I’m amazed at your large body of work . . . and the fact that you persisted with one book for 22 years. Wow! Wonderful, Marian with terrific photos. Thank you. I can relate. My daddy died in 1959 when I was 14. He was always loving and never complained during his 12 years of illness. He was the “motherly” snuggly parent, a farmer as a kid. My grandpa farmed with mules in Missouri and my dad decided to do the same when he graduated from high school in 1933, but the depression hit and he became an 18 year-old in deep depth. So the next job with a firebrick company sent him to Ohio where he met my mama and brought her back to his hometown. I felt safe and loved in that world, especially at my grandparent’s farm, but I also saw my daddy’s stress because of health or because of problems with his building supply business. When Vic and I bought this deteriorating house in 1972, it came with a 1942 (or so) Farmall which I could never start. Vic used it to haul firewood and tend the land. It was a huge relief for all when he bought a new orange Kubota with working implements from a tiller to a brushhog that cut the fields and saved our long views. Best part? I could start it with a key!! I’ve seen the key-starting orange Kubota and you behind the wheel. Thank you for the thumbnail of family history here too, some of it matching my own ancestry, especially the farming with mules. I love seeing glimpses of nature when you post on Facebook ~ and on your blog. You always take some much time responding to my blog posts. It feels like a real conversation. Thank you from the bottom of my heart, Elaine!